From World's Kitchen – For those who love to experiment with cooking! Hello people, I hope you are all good and healthy . Today we have a special guest on our Food Blog, and the post is not a normal recipe post. We are doing a Book Giveaway and interview with Author Mindy Johnston . ‘Halal Comfort Food’ is her debut work which has a guide for Halal Foods for newly reverted Muslims and many of your favorite dishes with Halalified recipes . I have the copy of her book and believe me even as born Muslim they were few things I didn’t know come under the details of Halal food. To Enter the Giveaway for getting your copy of the book . The rule is simple , answer the question below in comment box and I will message you to get your delivery address if you are the lucky winner . There is only one lucky winner. What is your favorite relief moment when you were looking for Halal food in a strange place , what did you find ? You can read the full interview below . How did the Idea for Halal Comfort Food struck you ? MJ: Before I converted to Islam, I had spent several years developing recipes for a completely different cookbook. Once I converted, I realized that those recipes were basically useless, as they were full of haram ingredients like alcohol and pork products. So I was stuck for a while, trying to figure out whether I should just throw out the recipes and give up on the book, or whether I should keep working on recipes for another cookbook. But the thing is, I really liked a lot of those recipes, and a lot of the foods that I used to eat. So rather than just give up, I thought, why not just take those recipes and remake them with halal ingredients? So I started experimenting with foods and recipe substitutions, and found that the results were really good! And since I figured there are a lot of converts out there who might also want to find halal versions of their old favorite foods, I thought, why not make a cookbook featuring those foods and helping others to figure out how to make halal versions of their favorite foods as well? So this became the main theme of the recipe section of the cookbook. And since it was mainly geared toward converts, I also included information on what is and is not halal, and recipe substitutions so that readers can give their own recipes halal makeovers as well.I also included information on what is and is not halal, and recipe substitutions so that readers can give their own recipes halal makeovers as well.I also included information on what is and is not halal, and recipe substitutions so that readers can give their own recipes halal makeovers as well. 2. When did you first realize you wanted to be a writer ? MJ: I started writing when I was pretty young, but it took me a while to figure out what I wanted to write. I started out writing poetry, then progressed on to short stories. Eventually I decided I wanted to write novels. But though I have started several novels over the years, I have sadly never finished one of them! After a while though, probably while I was in college, I realized I had a knack for writing nonfiction. And since I have always loved cooking as well, I finally thought, why not combine the two? And so after I graduated from college, I began working on recipe development for a cookbook. I have to admit, I thought that writing a cookbook would be easy, but considering the time it took me to develop all those recipes and put them together, it was not such an easy task after all! 3. Tell us 3 things about yourself which are not mentioned in the Author description of your book ? MJ: I am an avid coupon-er. I love a good deal, and am very thrifty! In addition to my love for food and writing, I also love clothes and fashion in general. I also sell Islamic clothes and other fashion accessories like vintage purses and shoes on eBay. I used to be a vegetarian. This didn’t last once I got pregnant with my first child and started craving steak, however! But this is where my interest in food ingredients and recipe makeovers began. I can tell you, it is a lot easier to make a halal version of mac & cheese than a vegan one! 4. How long did it took you to write this book? MJ: All in all, it was about 5 years of recipe development, but that took a bit longer than it might have taken otherwise since I more or less restarted in the middle of it. Once the recipes were ready, the actual writing probably took only a few months. 5. What is your work schedule like when you’re writing or when you wrote this book ? MJ: I work full time, Monday through Friday. I work on developing recipes as much as possible since I have to cook every day no matter what. But the majority of the writing took place in the evenings and on the weekends. MJ: I love to read, though I don’t always have time to do so. When my schedule is too hectic for reading, I still like to get my reading fix, so I listen to a lot of audiobooks! I like to watch movies with my husband, and when I have time I like to do fun things outdoors, like taking the kids swimming or go hiking. 7. Who else is in your family and what do they think of your writing? MJ: I have a husband and two daughters. They are all pretty happy with the recipe development part of my writing habit, because it means they get to try out all my experiments! My husband especially likes to make recipe requests, lol. 8. What was one of the most difficult thing you learned in writing a Halal Food book? MJ: The most difficult part of writing this book was probably finding source materials to properly explain which foods are and are not halal. It seems pretty simple, just going off of what the Quran says, but there are actually a lot of differing opinions out there, and not many books on the subject (not in English, at least). For example, some people feel that shellfish is haram. Some people will eat only certified halal meat, while others feel it’s fine to buy non-zabihah meat and just say “Bismillah” over their food before eating. My goal was not to tell people what to do or how they should eat, but to present all of the information so that they could make up their own minds. 9. Which is your favourite book? MJ: That is a really tough question! There are so many books that I love, it is hard to pick just one. To be completely honest, I really love reading YA novels, especially ones that deal with the paranormal, like Twilight. I also love dystopian novels, like The Handmaid’s Tale and The Hunger Games. 10. Do you have any message for your readers ? MJ: Play with your food! I just want for my readers to have fun in the kitchen, and not feel as though they are constrained in any way by following a halal diet. There are a lot of times we may want to try some food at a restaurant or office party, but we hold back for fear that it may have some questionable ingredient, or is made with meat that is not halal. But rather than feeling left out, know that there is nothing we can’t have if we are willing to get a little creative in the kitchen! 11. Is there any new book you are already working on or planning to start with? MJ: Yes, I am currently working on recipe development for my next cookbook! I can’t say when it will be ready, but I plan to have a lot more recipes in the next one, and a wide variety of foods from around the world, in addition to more halal makeover recipes! I wish you all the best for the success of your book and In sha Allah we will see you with many more books. Matar Kulche is a famous North Indian Street food. I have absolutely loved it since my college days. 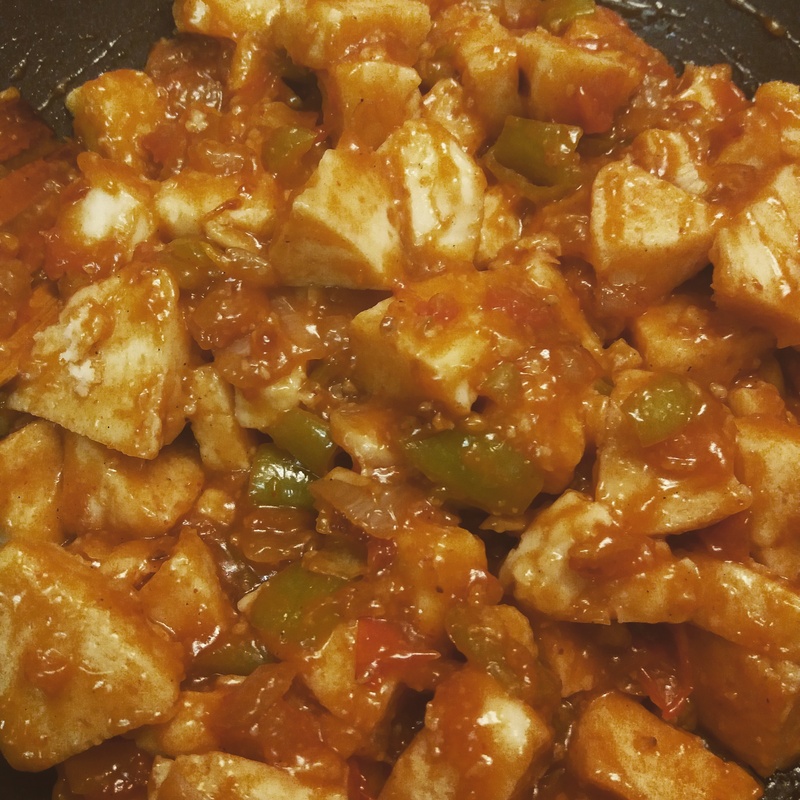 It is vegetarian dish, easy to cook and very nutritious. The good thing is this chaat is cooked without any oil , can be eaten as salad too. My husband eats it like a salad and the Kulcha are his bread to supplement the Salad , Being an Indian I can never get the idea of Chaat being a Salad , it is a Chaat !! It is called Matara or Matar ki chaat interchangeably. 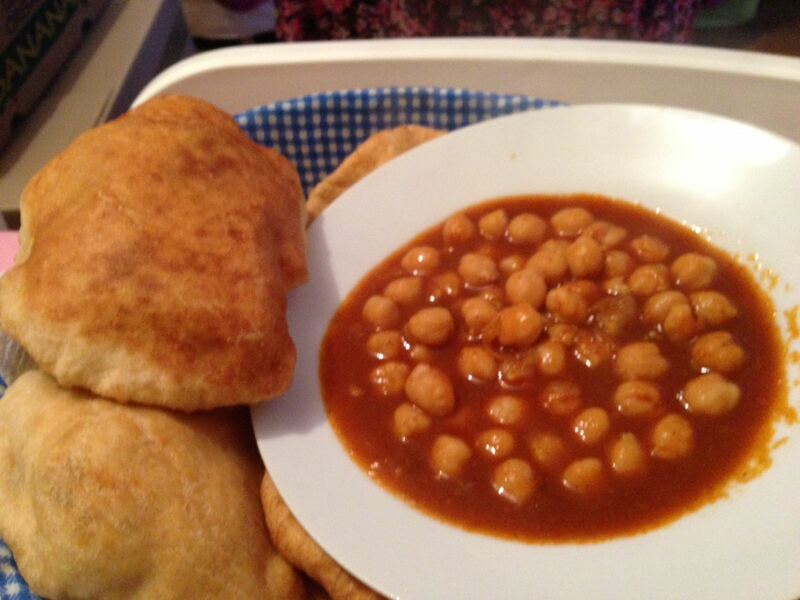 I have put here both the recipes for Chaat as well the Kulchas. 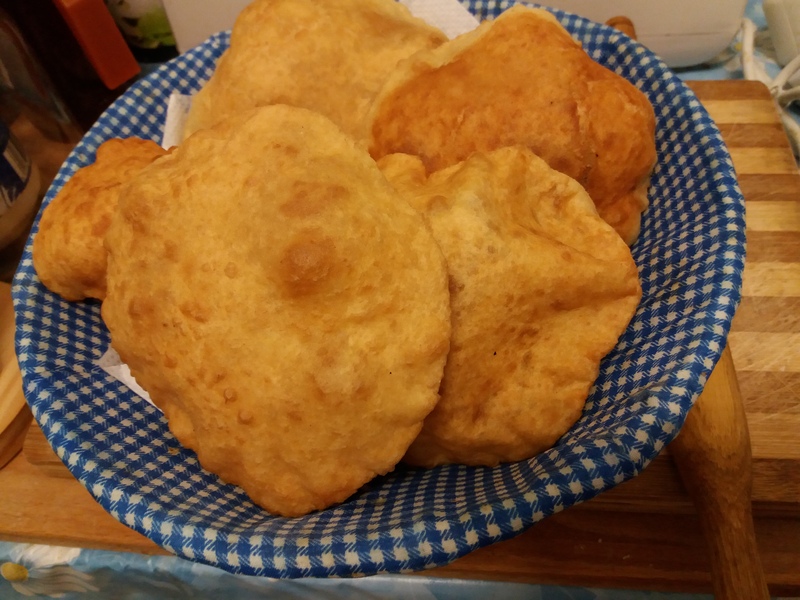 For kulchas I have mixed Whole Wheat flour and Normal flour to keep them healthy. To simplify for my non Indian friends, Kulcha is the bread that you see here in the picture and Matar Chaat is the name of thing in the bowl below. Matar means Peas in Hindi , and it is made from boiled dried white peas which you can find in Indian Store and most of the spices that are mentioned below can be find there. 2 cups Dried White Peas ( Popularly called Matra in North India) soaked for 3-4 hour in water. Tamarind pulp – 1 -2 tbsp ( or more as per your taste) if you like too tangy. Add in all the spices except chaat masala , Amchoor powder and Tamarind pulp with the soaked Matara. Add two cups of water to it. Boil the matara in a pressure cooker on low for 15-20 minutes. Check it if they are cooked. Add in Chaat masala ,Amchoor Powder and Tamarind pulp . Cook it without lid for 5 mins. Garnish your Matar chaat with chillies,boiled potatoes , onion,tomatoes ,ginger and lemon . and half cup warm water to knead the dough. Mix the two flours, Add the dry ingredients first , then add yogurt and mix well, knead the dough with warm water carefully . Put 1 tbsp of oil and knead for another minute so that oil gets absorbed in the dough. Keep the dough aside for 2 hours. Meanwhile put some ghee or butter on flat pan on medium hot flame. Take some dough into your hand , apply some oil and make a small ball . Press it with help of hands and try to flatten it . Once you flatten it with your hands, put some oil on the rolling surface and lightly press it with a rolling pin to even out . Put it on the hot pan greased with some butter , let it cook and flip to cook other side . Similarly roll out the remaining kulchas and cook them on the pan. Serve them with matar ki chaat( dry white peas). Chorba Frik or Firik ( Read as Shorba Freek) is quite popular soup in Ramadan in Mediterranean countries like Algeria,Tunisia and Morocco. It is so easy to cook as well and tastes great along with its satiating fragrance of coriander and mint . In my recipe I have used meat balls but you can add normal chicken and meat pieces too. handful of chickpeas- soaked overnight. 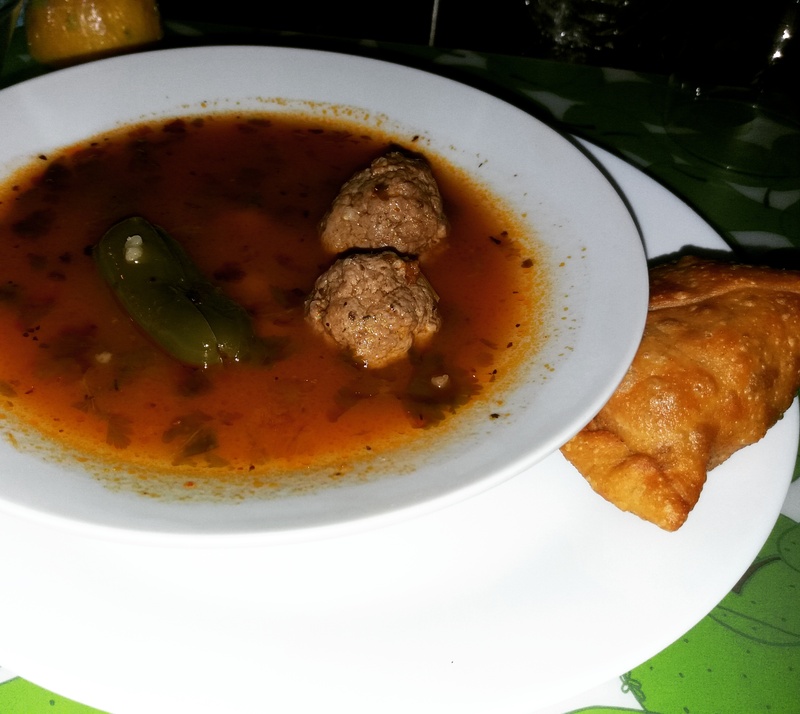 (7-8) small meat balls made from keema added with some herbs and spices of your choice. **Harisa is chili paste for my friends who donot know. 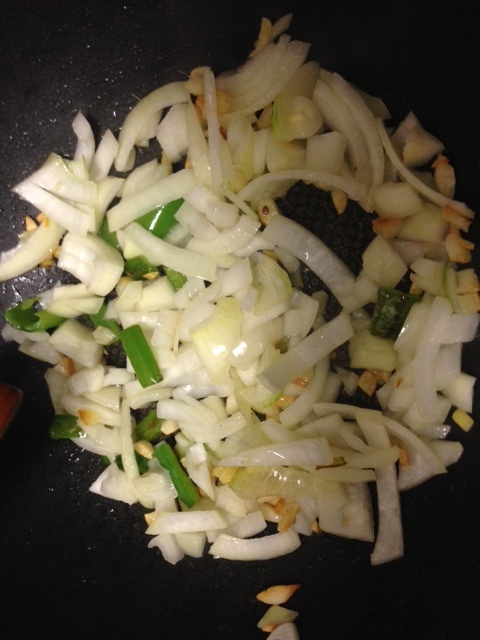 In a wok/pan heat oil and add bay leaf, chopped onion, garlic, chili and fry them for 3-4 minutes on medium flame. Add the spices and fry for a minute. Add tomato puree and Sauté for 2 minutes till you see oil separates from gravy. Add now 5-6 cups of water and bring to a boil. Now add meat balls, chopped coriander , mint , chickpeas and frik . Cover the lid and Cook it on low flame for 20 minutes . Garnish with some fresh coriander on top and lemon juice before serving. You can choose to make it thick or watery , as you prefer to have your soup. If you want it more thick add less water .We like it a bit more liquid. 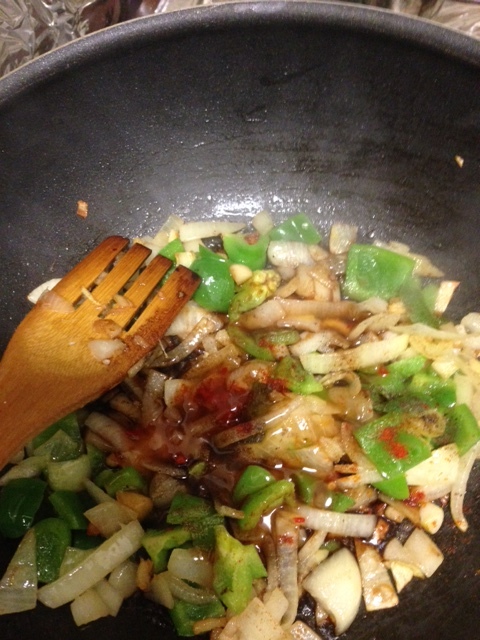 Add oil to the wok, once heated ,add ginger garlic and chili pieces first.Saute them. Once,done add the onion pieces and saute them until they become a bit transparent. 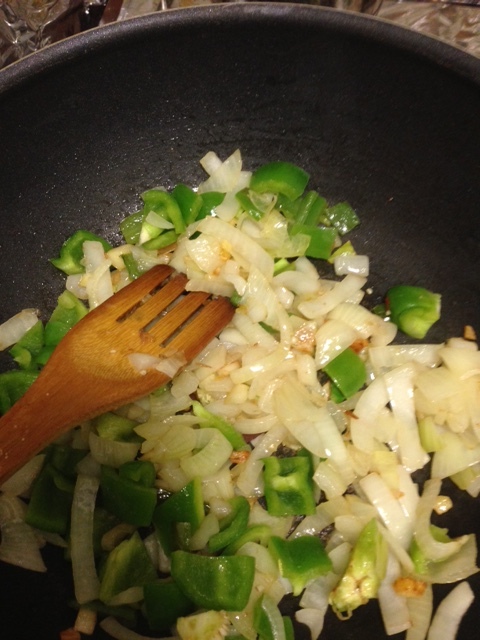 Add the green pepper at end,since they cook faster and they should not be too soft, a bit crunchy taste better in curry. 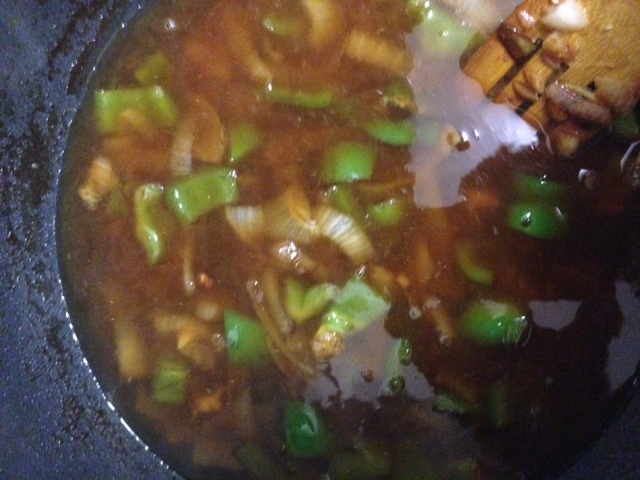 Now,add soy sauce,salt ,pepper,chili powder, thai chili sauce and vinegar. 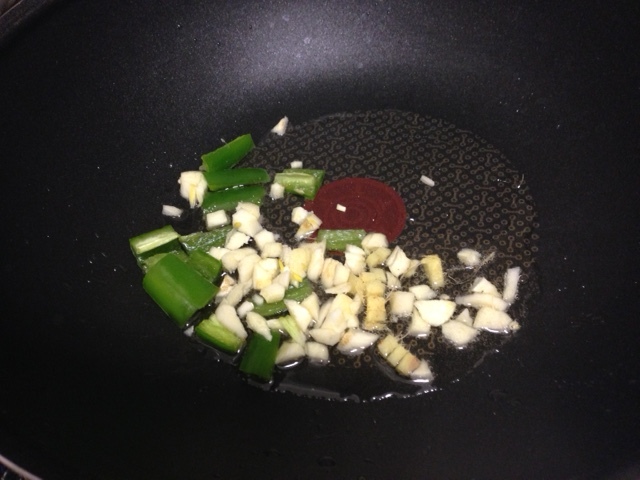 Add about 100 ml of water into the wok and add one chopped garlic clove, let it come to a boil. Take 2 tablespoon of cornflour, mix in 50 ml water , and add to the wok. 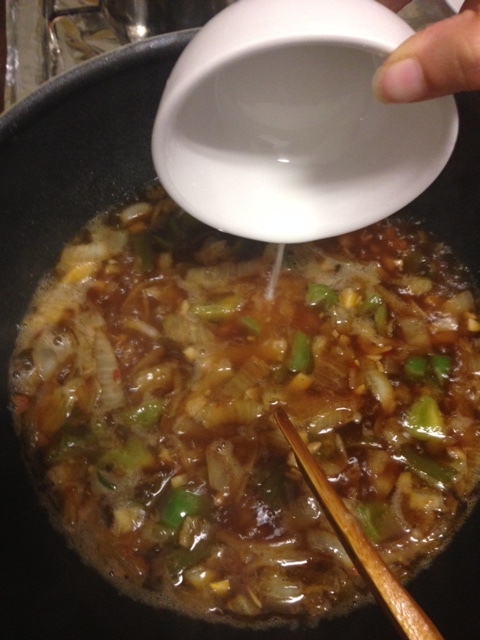 Stir the sauce until you see it become thick. check the salt and spice level. You can add more as per your taste. Now add a tablespoon of ketchup to give it a bit sweet taste.You can skip it as well if you don’t like sweet taste in your food. Add the idli pieces to the sauce toss, cover , put on low flame for 3-4 mins. For garnishing add sesame seeds on top and eat it like a starter or maincourse. 1 and half cup warm water to knead the dough. Meanwhile put the oil in Kadhai ( Indian Wok ) on medium hot flame. Take some dough into your hand , apply some oil and make a small ball . Press it with help of hands and try to flatten it . Once you flatten it with your hands, put some oil on the rolling surface and lightly press it with a rolling pin to even out . Put it into the oil and fry , till you see both sides golden . Similarly roll out the remaining Bhatooras and fry them. 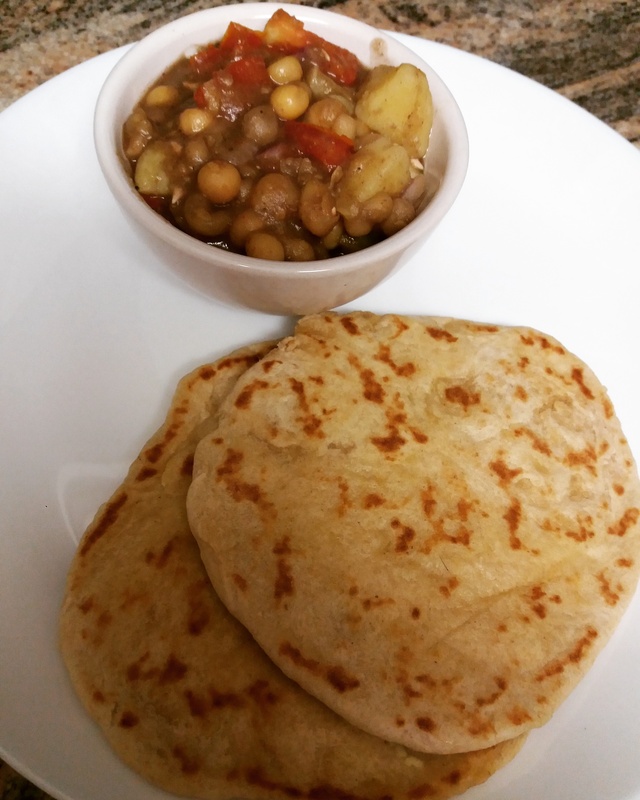 Serve them with Chhole ( Chickpeas curry ) . 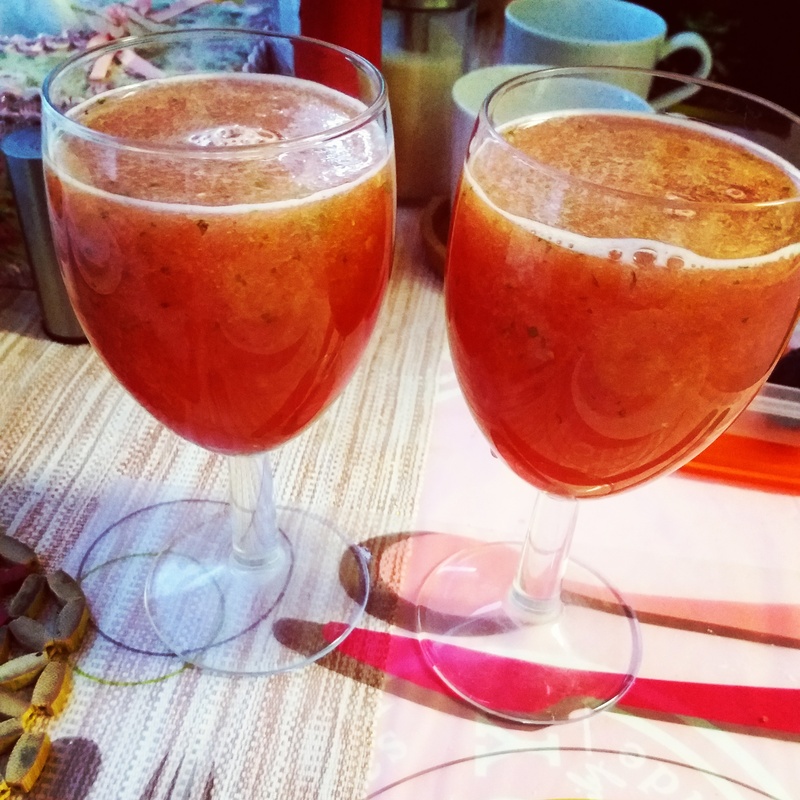 You can find a lot of tried and tested recipes on Recipe Hunter’s Blog plus she has shared information for a lot of cooking blogs in her this blog post ! If you wish to have your social media / blog information added, please leave your information on original post: An open invitation to all Bloggers and I will be more than happy to add your information. Meet Ella Price @ My Favorite Recipes. Meet Jo Ann @ fearlessinjesuschrist and read all about her found hope and victory in Jesus post. Meet Sue @ MY LOUD BIPOLAR WHISPERS and read her story and journey about living, surviving and thriving with bipolar disorder.